Updated Tuesday April 9, 2019 by Carolyn O'Leary. The INCLUSION REVOLUTION enters year 2! 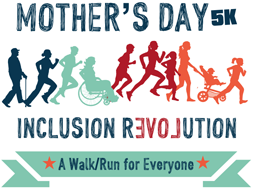 This will be a 5K Run/Walk for everyone on Mother’s Day. It will be inclusive of all, especially those with disabilities normally preventing them from participating in a 5K. Please email the race director at marksigrist1@gmail.com if you have questions regarding accommodations you or someone you know might need in order to participate. Further, we will be going GREEN in this event and will work toward zero waste. We will not be purchasing Single Usage Water Bottles for the Finish Line Area, but instead will dispense water from 5lb Igloo Coolers. We will use compostable cups on the event course and also in our Finish Line Area. Compostable cups and food scraps will be hauled away to an industrial composting site to create topsoil. More to come.... But if you are looking for an Eco Friendly Event, we will work toward being the benchmark in Central Ohio for such events.